Josephine started Ballet lessons at a tender age of five at City Ballet in Ipoh, Malaysia. After completing her academic education, she enrolled in the National Art Culture and Heritage Academy (ASWARA) and obtained a Diploma in Dance in 2012. There, she widened her repertoire to include Contemporary and Traditional dances. 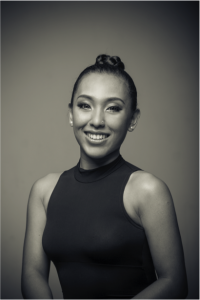 She is currently pursuing a Bachelors Degree in Dance and is actively attending dance conferences in Malaysia and Taipei, and is also actively performing locally, and has also represented the county in Beijing, Mongolia and Papua New Guinea. To widen her knowledge and scope in dancing she is currently training to teach the Imperial Society of Teachers of Dancing Modern work, and has plans to also pursue a Masters in Dance. In 2013, Josephine won the Best Female Dancer category at the Short + Sweet Dance Festival at the KLPAC.